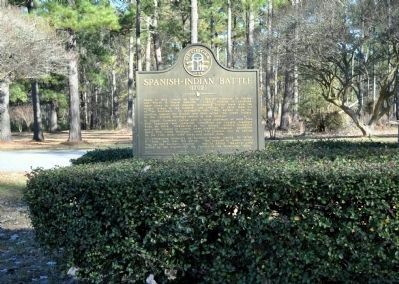 Early in 1702 Joseph de Zuñiga, Spanish Governor of Florida, and Pierre le Moyne Iberville, French founder of Louisiana, made plans to check steadily increasing English trade with the Indian tribes in the interior, and perhaps to drive them out of the Southeast. To accomplish this, they agreed to an expedition against the English and their allies, the Creek Indians, in the Carolina territory which is now Georgia. In August, Governor Zuñiga sent a force northward of more than 800 Spaniards and Apalaches commanded by Captain Francisco Romo de Uriza. Forewarned by the Indians, Anthony Dodsworth and other traders at Coweta (near present Columbus), marshalled about 500 Creek warriors, lured the invaders into an ambush on the Flint River near here and routed them. A companion Blue Star Memorial Highway marker stands to the left in a nicely landscaped island. Location. 31° 57.636′ N, 83° 54.661′ W. Marker is near Cordele, Georgia, in Crisp County. Marker is on Cannon Road (Georgia Route 230) 0.2 miles south of Andersonville Trail (U.S. 280), on the right when traveling south. Touch for map. 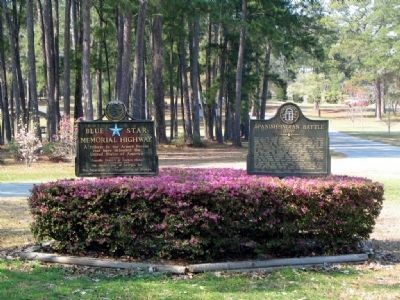 The marker is in the Georgia Veterans Memorial State Park, on the road leading through the main entrance. A parking fee is charged to enter the Park. Marker is in this post office area: Cordele GA 31015, United States of America. Touch for directions. Other nearby markers. At least 8 other markers are within 8 miles of this marker, measured as the crow flies. Camp Safety Patrol (approx. half a mile away); Georgia Veterans Memorial State Park (approx. half a mile away); Veterans of Foreign Wars Group Camp (approx. half a mile away); a different marker also named Georgia Veterans Memorial State Park (approx. 0.6 miles away); Blackshear Trail (approx. 5½ miles away); Fort Early (approx. 7 miles away); Crisp County (approx. 7½ miles away); The Luther Story Bridge (approx. 7.8 miles away). Touch for a list and map of all markers in Cordele. More. 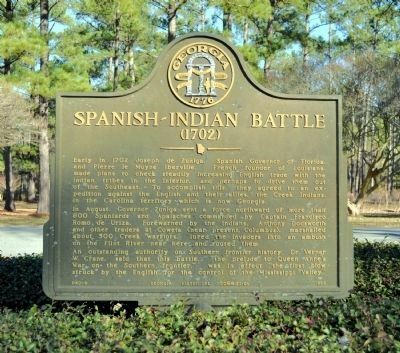 Search the internet for Spanish-Indian Battle. Credits. This page was last revised on June 16, 2016. This page originally submitted on October 1, 2009, by David Seibert of Sandy Springs, Georgia. This page has been viewed 1,495 times since then and 27 times this year. Photos: 1. submitted on May 2, 2012, by David Seibert of Sandy Springs, Georgia. 2. submitted on October 1, 2009, by David Seibert of Sandy Springs, Georgia. 3. submitted on May 2, 2012, by David Seibert of Sandy Springs, Georgia. • Craig Swain was the editor who published this page.